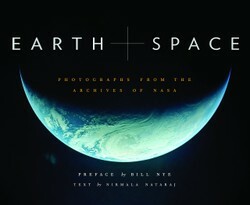 Earth and Space addresses worldwide interest in pictorial works which showcase astronomical photography of the Blue Marble and outer space by annotating twentieth and twenty-first century photographs from the archives of NASA. It begins with a preface by Bill Nye, chief executive officer of the Planetary Society founded by astrophysicist Carl Sagan (November 9, 1934 – December 20, 1996). It continues with three introductory pages and 79 pages of captioned explanations for 111 photographs by cosmology, ecology, and microbiology writer and science editor Nirmala Nataraj. The curated collection draws upon decades of photographs taken by astronauts and by space-based observatories for the National Aeronautics and Space Administration’s image and information-rich archives. It ends with bibliography and image credits. The curated collection furnishes images from every decade, excepting the 1950s, since NASA’s funding in 1958, the year after the Earth-orbiting, Soviet Union-launched object Sputnik (“Companion”). It gives the automatic Command Module apogee camera’s 70-millimeter-filmed photograph of Earth from the unmanned Apollo 4 mission test-launching Saturn V on Tuesday, November 9, 1967. 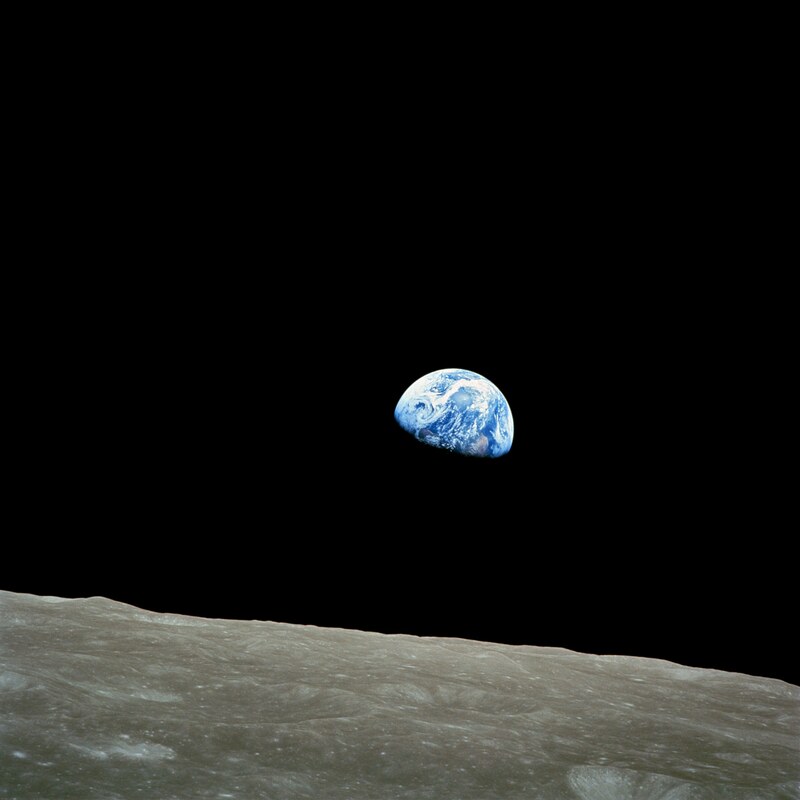 It has the iconic “Earthrise” of Tuesday, December 24, 1968, by astronaut William Anders from Apollo 8’s spacecraft 484 miles (778.92 kilometers) above the lunar surface. It includes the first photo taken of Earth in its entirety, the iconic Blue Marble image from the Apollo 17 mission on Thursday, December 7, 1972. Koichi Wakata’s crescent moon joins as an International Space Station Expedition 28-tweeted photograph. Visibility of distinct colors: dominant gases and particles in each atmospheric layer act as prisms to filter out certain colors of light. The pictorial work keeps to an observation-friendly organization by sequencing photographs along astronomical progressions from the solar system, through the Milky Way galaxy, into deep space. It leaves space shuttle Discovery-photographed, lower and upper atmospheric aerosol gas-caused Asian brown cloud pollution for Jupiter’s Europa and Io, Mercury, Neptune’s Triton, Saturn, and Venus. The Chandra X-ray Observatory, Herschel Space Observatory, Hubble and Spitzer Space Telescopes, and Wide-held Infrared Survey Explorer make possible photographic journeys inside and outside the galaxy. Hubble needs 97-minute orbits 353 miles (568.09 kilometers) above Earth at 5-mile-per-second (8.05-kilometer-per-second) speeds for its main 7.9-foot-diameter (2.41-meter-diameter) mirror to realize near-infrared, ultraviolet, visible image-capturing. En route, it operates near-infrared, survey and wide-field cameras, sensors, spectrographs, and spectrometer. Earth and Space presents Earth’s neighbors, beginning with the constellations Cassiopeia and Cepheus and ending with the galaxy cluster MACS 10717 5.4 billion light years away. It quantifies the mechanics of space with dark energy, as 70 percent of universal mass; dark matter, as 25 percent; and visible matter, as 5 percent. It reveals Cepheid variables for calculating extra-galactic distances; hypernovas for exploding bigger, longer, louder than supernovas; and star bubbles for the Milky Way Project’s citizen scientists. It shows a universe whose cloud complexes, galactic and globular clusters, local groups, molecular clouds, planetary nebulas, and star systems become as familiar as our Earth. Earth and Space takes readers on culturally enriching, educationally entertaining, geo-historically enthralling journeys. An extraordinary tour of the universe via NASA's exceptional archives! 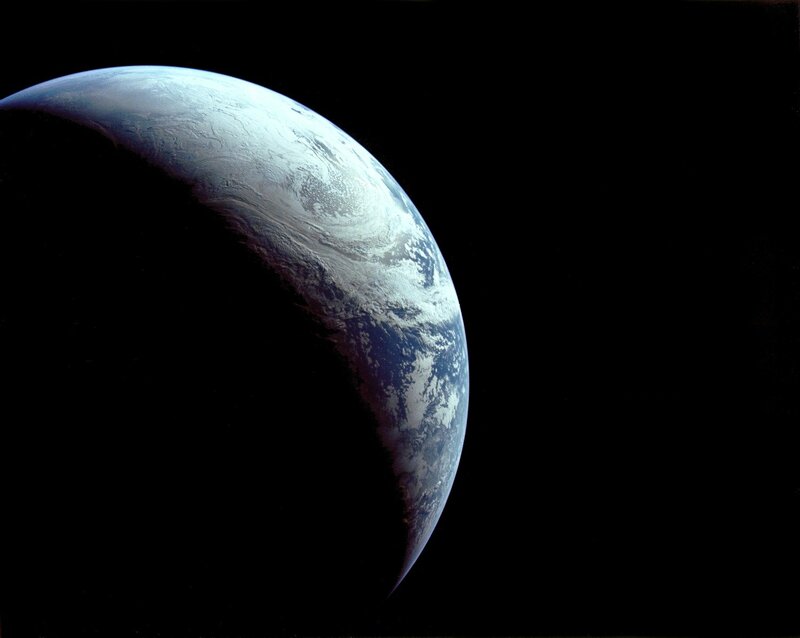 Earth from an altitude of 11184.681 miles (18,000 kilometers), taken by an automatic camera aboard Apollo 4. Antarctica appears at the top of crescent, with Africa's northwestern coast visible at bottom. Nataraj, Nirmala. 2015. Earth and Space: Photographs from the Archives of NASA. Preface by Bill Nye. San Francisco, CA: Chronicle Books LLC. Apollo 17's iconic image, taken on December 7, 1972, continues to inspires updated versions that photogenically convey a wealth of information for NASA scientists. 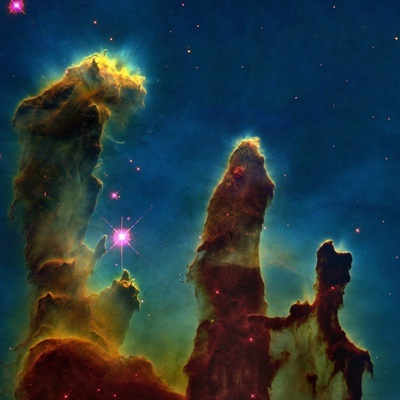 iconic NASA image, known as "Pillars of Creation," captured on April 1, 1995, by Hubble Space Telescope: elephant trunks (interstellar dust and gas) in Eagle Nebula, about 7000 light years from Earth. This compact, performance-packed telescope won't take viewers as far as NASA's Hubble Space Telescope but it still offers enjoyable, spectacular viewing opportunities! kimbesa, Thank you! This book is one of my favorites. I regularly pull it off the shelf to look at it since the photos sequence the sights successively through the solar system and the Milky Way into deep space. Wonderful pictures of earth in space. Awesome is the right word fo these! blackspanielgallery, Yes, NASA has great images. It's the beauty, the information and the organization that makes me proud to have this book. It's organized from nearest to furthest from us so it's like a road view trip! Nasa has many great images, and some or online. sandyspider, Me too, I find NASA and space super-interesting! The NASA site is one of my favorites to visit ;-D.
Mira, The James Webb Space Telescope is set to be launched in October 2018. NASA scientists are hoping that the two telescopes will be able to work together at least until 2020. Hubble somewhat can be repaired since the telescope orbits the Earth whereas the Webb will not be serviceable, by present technology, since it will orbit the Sun. I find everything about space and NASA interesting. Good review. Beautiful! I heard on TV that the battery on the Hubble Telescope will run out soon, and they plan to replace the Hubble with a much more powerful telescope.